Bellavista always has MANY birds around particularly in the early morning. This time of year is remarkable for the diversity of nesting species! 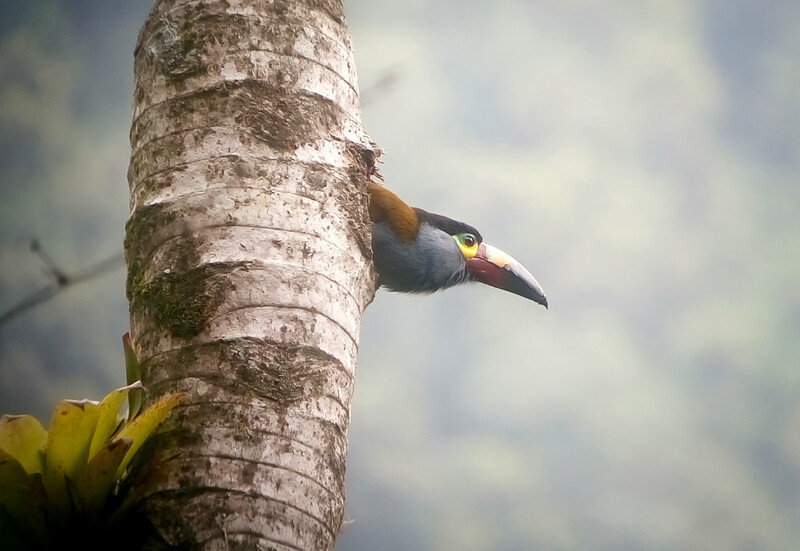 A short list as I write includes: Plate-billed Mountain-Toucan (photograph shows one at its nest), Russet-crowned Warbler, Orange-bellied Euphonia, Swallow-tailed Nightjar, Striped Treehunter, and Beryl-spangled Tanager. A survey this July recorded an American Pygmy Kingfisher. This bird is usually found only up to some 600 meters, yet we are at 2200 / 2300m meters elevation. Perhaps it was using our region as part of a flyway over the Andes? Are the Andes really a barrier to small birds? Surprises never cease! Conservation and Birdwatching at Bellavista Lodge and Reserve is our reason for existence. The Lodge opened to make conservation possible and to teach about conservation, and this remains its foundation. Over the more than twenty years of our existence, our private reserve has grown from 55 to 700 hectares, and has become a highly respected birding and ecotourism destination in northwestern Ecuador. Conservation work is supported by some scientific study (although there is room for much more) and we receive groups of students who want to learn about cloud forest in an accessible and safe, comfortable environment. The local community has benefitted, since we employ people who have grown to appreciate the forest environment instead of actively cutting forest down, or have learnt to be knowledgeable bird guides where their fathers were farmers who looked after a handful of cows. Other locals have taken the initiative to create reserves that protect species not found in our reserve, making visitor destinations that complement what is found at Bellavista. Conservation is an essential tool to maintain a viable planet, both for today and for the future. Your visit will help our conservation efforts here in Ecuador! And Ecuador is not really far away, and offers excellent facilities and surprisingly good roads!